A totally cool jazz cover of Neil Young's "Down by the River" by Buddy Miles. From the album Buddy Miles Live 1971. A west coast tour from Seattle, WA to Bakersfield, Calif. A true musical treasure. Buddy Miles passed away in 2008. Buddy's drumming on Jimi Hendrix's final album Band of Gypsy's has been hailed by fans and critics ever since. Also, see Jimi Hendrix and Neil Young at Woodstock. More on other musicians' connections with Neil Young. Wow, hadn`t heard that before but glad I`ve heard it now. That is a seriously good cover of DBTR by the very talented Buddy Miles, and doesn`t it lend itself well to a jazz interpretation. This is why live music is better. Thanks Thrasher! A lot of Neil`s songs, especially his long songs, leave enough `space` for free improvisation and interpretation, in what you could call a `jazz` style, when played live. I remember when he was last in London in `09, seeing him perform an epic version of Words as well as DBTR, amongst many others including Spirit Road, which left the audience spellbound. By the by, I saw Crosby and Nash last night in London and I must say they were in top form, their voices still clear and strong, and playing with an excellent band, including Crosby`s son, James Raymond on keyboards. They performed a mixture of old and new, and it was wonderful to hear oldies like Déjà Vu especially, given a fresh treatment with extended individual solo jams by each of the band members. Oh, and a surprise guest was Alan Clarke joining them on stage for an exhilarating old Hollies hit `Bus Stop`. They left the stage to a standing ovation, very well deserved. Would love to hear another jazz interpretation by say... Miles Davis, with some serious improvisation. It's always cool to hear other artists interpretations. Yes Thrasher, I agree, that would be really interesting. I love how some songs/artists are able to slide between genres. I don`t know whether you`re familiar with the maverick classical violinist Nigel Kennedy, who also plays jazz, but here is a man who (like Neil in fact) is in love with music and knows that good music is good music regardless of genre or category. He has also (like Neil) lead his career very much in his own way regardless of criticism from the classical establishment. Here`s a vid of him covering Jimi`s 3rd Stone From The Sun. Actually I rambled off topic a bit there I`m afraid, but I`ll leave it as it is - someone might find it interesting! 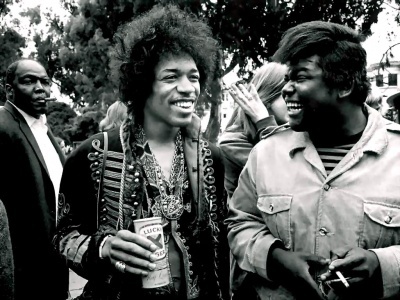 Buddy Miles Was A Very Close Personal Friend To Me. I First Met Buddy 1n 1969-1970, when I Booked 'The Buddy Miles Express' into My Chicago Rock Club Named 'Beavers'. Our Friendship continued by way of 'The Music Business' and Concert Tours; plus onward to Atlanta and Back To Chicago in 1990,... when Buddy Asked Me To Be His Manager,..And Always Be His Friend, Which I Always Have. Very similar version by Roy Buchanan on 1978 album "You're Not Alone". I think I like his version from "Them Changes" earlier release more. Actually, Them Changes was a great take also. Saw him in the Big "O" sometime in the 80's doing alot of Hendrix and playing some mean guitar.